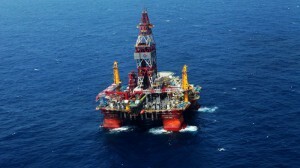 A controversial offshore drilling platform has started deepwater operations in the South China Sea, which officials said would supply liquefied natural gas to the “Greater Bay Area” in the future. It is the first Chinese-built deepwater rig, and its first deep-sea well was completed in eastern waters of the South China Sea in recent days, according to a statement by its operator, state-run China National Offshore Oil Corporation (CNOOC). The well is 4,660 metres deep, with a true vertical depth — or the distance in a straight line from the surface to the bottom of the borehole — of 2,529 metres. Han Xiaoping, chief analyst at energy industry website china5e.com, called it a “breakthrough”. “This is a breakthrough for China, because it was very challenging for CNOOC to drill a well with such a depth [for the first time],” Han said. Once the rig starts production, LNG from the well will be transported to CNOOC’s gas terminal at Gaolan port in Zhuhai, Guangdong province and it will supply energy to a population of 70 million in the Greater Bay Area, according to the company’s statement. It did not say when production would begin. The Greater Bay Area refers to the Chinese government’s scheme to link Hong Kong and Macau with the southern cities of Guangzhou, Shenzhen, Zhuhai, Foshan, Zhongshan, Dongguan, Huizhou, Jiangmen and Zhaoqing into an integrated economic and business hub. Han said that since the area aimed to rival Silicon Valley and Wall Street combined, a reliable clean energy supply was a must. “If LNG can be directly transported to the Greater Bay Area by pipeline from CNOOC’s terminal in Zhuhai, it will save a lot on transport costs for the power companies — and residents will also benefit,” Han said. The Offshore Oil 981 drilling platform is a sixth-generation ultra-deepwater rig that was developed by state-owned shipbuilder China State Shipbuilding Corp for CNOOC. Work on the platform began in May 2012 in the South China Sea, where Beijing has territorial disputes with Vietnam, the Philippines, Malaysia and other neighbouring countries. The Chinese rig was originally located in waters contested with Hanoi, but it was moved after it sparked a violent dispute between the two countries in 2014 that saw deadly anti-Chinese demonstrations across Vietnam. The South China Sea is believed to contain rich reserves of energy resources such as natural gas and oil. The US Energy Information Agency estimates that it holds about 190 trillion cubic feet of natural gas and 11 billion barrels of oil in proved and probable reserves, most of which lie along the margins of the South China Sea rather than under disputed islets and reefs.